Welcome to DroidGaGu the site where you can find the logo quiz answers which you’re playing right now. Currently Logo Quiz game is the most popular and played game for Android and also for iOS devices (iPhone and iPad). One of the top Logo Quiz game already reach over 100 million downloads in Google Play Store alone. Though, it cannot beat Jetpack Joyride download which is over 500 million. Nonetheless, 100 million download still consider logo quiz game is popular. In one logo quiz game application there are thousands of logo, which you have to answer all of it. Ask your friends to join this game and compete with them who got the highest score! Share it on Facebook or twitter to make your friend envy of your score. In order to get the highest score you have to answer it correctly for first time. For second time or more the score will lesser. You can use hints to help you get the answer, however the hint not all are helpful. This is where DroidGaGu Logo Quiz Answers will assist you, just look in our site and search for what logo quiz game you’re playing with the level. You will find the answers here! - Ultimate Logo Quiz BySymblcrowd. 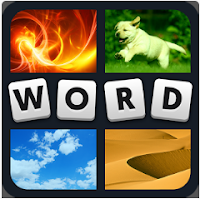 - 4 Pics 1 Word. Each of these logo quiz game application have their own specialty and characteristic. Which you will have to find out. Don’t worry if you got stuck, like we said earlier just look in our site for the logo quiz answers. Logos contained in the logo quiz game application are consisting of many company’s logo from around the world and various industries. For example there are company’s logo from auto insurance and life insurance company such as Geico, AIG, ING, Allianz and etc. There are also logos from car manufacturer such as Toyota, Mercedes Benz, Audi, Volkswagen, BMW and etc. Hopefully the Logo Quiz answers we provide here in DroidGaGu will help you finish the game with high score. For us, by looking the answers here is not cheating, it more of getting information and right answer without frustration. No one or very few person knows all the company’s logo around the world. Enjoy the logo quiz answers in DroidGaGu, click logo quiz game application below to start looking for answer. You also can use the search bar to looking for specific logo quiz answers. Follow our Logo Quiz Answers Facebook page to get the latest update. The latest update of the logo quiz answers will be constantly post on the Facebook page.